The Legends Moorland golf course is part of the Legends Golf Group located in Myrtle Beach, South Carolina. P.B. Dye designed this course from an inspired PGA West Stadium Course, featuring elevation changes, deep bunkers, multi-level fairways and greens, and water. As one of the most challenging golf courses on the east coast, Moorland will test golfer’s skills as they encounter the contour landscape and sandy bunkers. Golf Digest has given this par 72 course a 4.5 Star rating. Golfers find the 6th-hole as one of the most memorable holes that challenge them to use pinpoint accuracy. This hole, aslo known as “Hell’s Half Acre”, has a large bunker that guards the green. At this hole, deep undulations and bulkheads cause golfers to use skill and strategy to complete each stroke. Golf Tip: Lag putting will reduce high scores on the undulating greens. Remember to golf in Myrtle Beach at Moorland, a popular course frequented year after year by locals and tourists. Are you eager to play the most challenging of the Legends courses? Moorland is a can't miss, and at our reduced prices a great value. 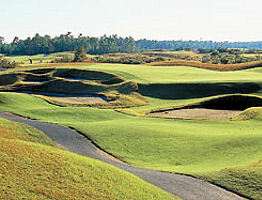 The Legends Moorland golf course is part of the Legends Golf Group located in Myrtle Beach, South Carolina.